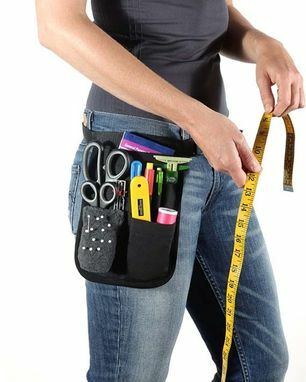 I named this the Royal Runway Designer Tool Belt after shipping several classic black with a grey fleece removable pincushion to a Design House who wanted them ASAP before the Paris show. Later this design house was involved with the "Royal Wedding". I can only imagine where my HipNotions might have been! It makes for an exciting story. 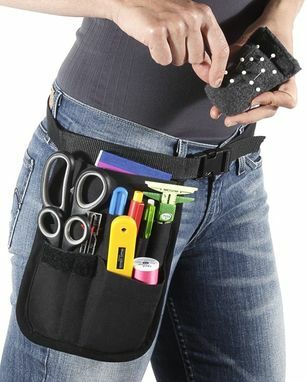 This a 9 pocket compact 7"x9" tool belt with a removable fleece pincushion or pocket. Scissors, marking pens and pencils, cell phone, notepads, tape, sewing notions, rulers, box cutters, index cards, receipt book and more can be stowed away ready to use while sitting, standing, kneeling or walking! Hands free! It has a 1" adjustable web belt adjustable up to 45"with a side release snap. Belt extension can be ordered and included with your order with no additional shipping charges.